It is the quickest to convert SWF to EPS singly and in batches with Flash to EPS Converter. With its simple but muti-functional main interface, Flash to EPS Converter can also support the edit of the properties of the images, even for the image special effects, it is still a simple case for Flash to EPS Converter. The trial version of Flash to EPS Converter can be downloaded here, which can be used for 20 times. Thus, to obtain this revolutionary tool permanently, click here to purchase it on the official website. Drag and drop the SWF files into the processing table, then the paths of the SWF files can be displayed in the processing table. Press ADD SWF File(s) > choose the SWF files > press Open on the main interface to add the SWF files. Use the right button of the mouse to click the processing table > click Add Flash files > select the flash files > click Open. All of Windows systems with Adobe flash plug-in installed. Preview the flash files and the images flexibly. Convert flash to image in batches, e.g., SWF to EPS. Support the various conversions based on the SWF files, e.g., SWF to GIF, SWF to TIFF, SWF to BMP. 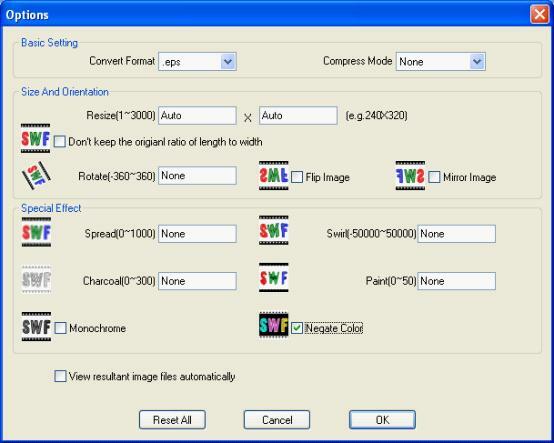 Support the different compression modes of the images, e.g., LZW, RLE, Group4, FAX, Zip.